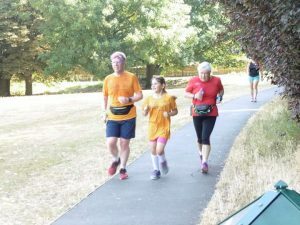 Harlow parkrun (my 60th different parkrun location) was an opportunity to meet with my friend Catherine and her daughter Alex. It’s described as an “undulating” course, and that sums it up: not actually a huge amount of ascent (just 53 metres) but it makes its presence felt more than one might expect. There’s a mixture of woodland and some very brown grass. The uphill start was very congested, but after a while I was able to stretch out a bit. Once I’d finished, I went back to find Catherine and and Alex and ran the last lap with them. We chatted for a while then Catherine took Alex off to get her ears pierced. 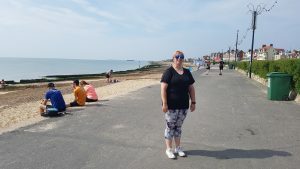 The plan to meet up with a friend in Clacton was abandoned as she wasn’t well, so Lucy and I went to Felixstowe for my second visit, where parkrun is along the prom: pancake flat apart from the gentlest of rises over the entrance to the pier. I set off too fast (5km PB pace) and couldn’t keep it up, but still finished in a good time. It’s a course with out-and-back in one direction, then out-and-back in the other. 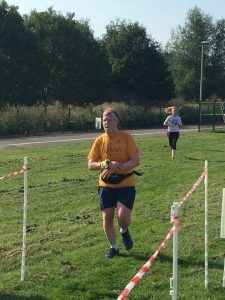 So by the time I’d finished, Lucy had gone past the finish into the second leg; I got my breath back then went to catch up with her, but it took far longer than I’d expected, and I only caught up at the second turn-around point. We ran in together, she knocking 45 seconds off her PB, which was fab. 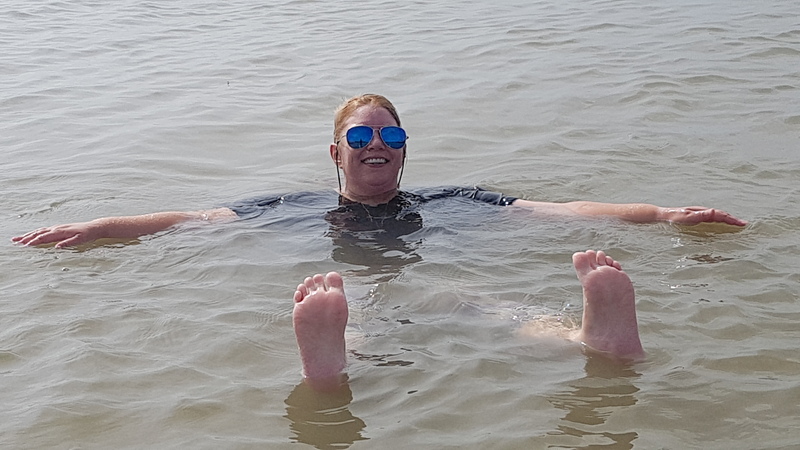 We then went for a paddle (in my case) and swim (in Lucy’s case) in the sea to cool off, followed by a lovely ice-cream. A brilliant start to the day. I still can’t quite believe I’m going running with Lucy – it seems so unlikely. 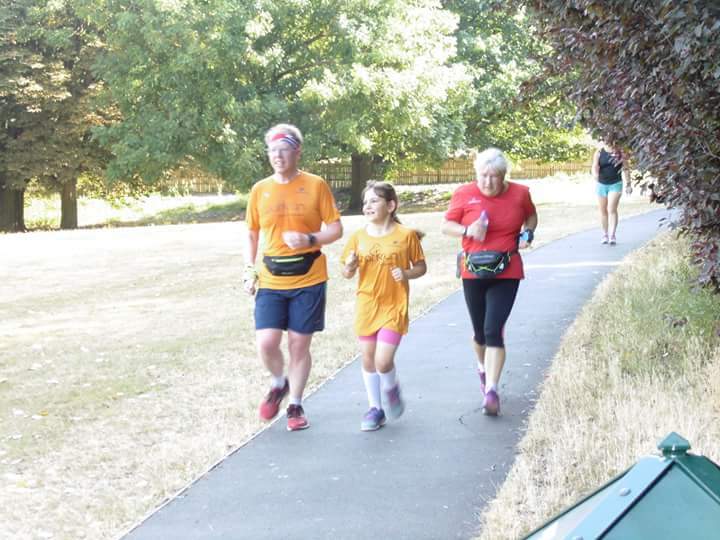 My 100th parkrun was at Letchworth yesterday, my 61st parkrun location, en route to lunch in Surrey. This is the local parkrun for a couple of friends who were there to help mark the occasion, though Kate didn’t feel great as one of her contact lenses was malfunctioning and making her feel sick. Lucy was on finish tokens: I got a “99½” as I finished the first of two laps, and a nice cheer across the finish line. A surprisingly tough course: about three-quarters of it is on tracks and around field edges, with the relatively modest undulations (macro and micro) making their presence felt more than the numbers might have suggested, and lots of dodging around holes underfoot. Fortunately, despite a month’s rain in 36 hours, the previously dry ground meant that Calamity Corner didn’t live up to its name, being merely sticky, but I can see how it would be interesting in the winter. 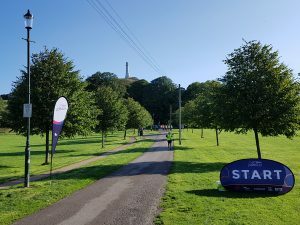 Ford parkrun is named after Ford Park in Ulverston. We’d popped up to the Lake District for the August Bank Holiday weekend. At one point I’d considered visiting Whinlatter, another Cumbria parkrun I haven’t yet been to, but Ulverston was closer and fitted in better with plans for today, so our weekend started off with me running the parkrun while Lucy watched and cheered with the dogs. 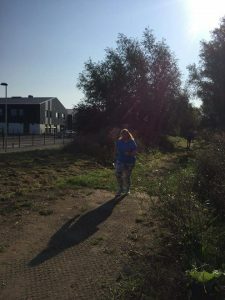 The course description on the website is one which risks sowing confusion rather than light, and makes me grateful I’m in the middle of the pack and so usually need only to follow the person in front (but see Fritton Lake). The start and the green field of the park are overlooked by the Hoad Monument, but once underway the focus is on the many twists and turns which make for an interesting run. Still recovering from the pain in my bottom (self-diagnosed as a strained piriformis muscle), I tried to take it easy, but found myself as so often finding someone to latch onto and pull me round a little faster than I felt comfortable with – we both accelerated in the final circuit of the field, but she pulled away for a sprint finish while I’d already given what I could. On only its third run, the organisation was excellent though the marshals were rather quiet. Lucy and I visited Littleport parkrun at the start of September, thus allowing me to complete Cambridgeshire again (for the third time). It was a decent sized crowd gathered outside the leisure centre on a beautiful summer morning for two-and-a-bit laps of two grassy field, linked by a relatively narrow trod and a broad tarmac path for a bit of variety. I’m still suffering from the effects of relatively little running (and too much gained weight) but was reasonably satisfied with my run. 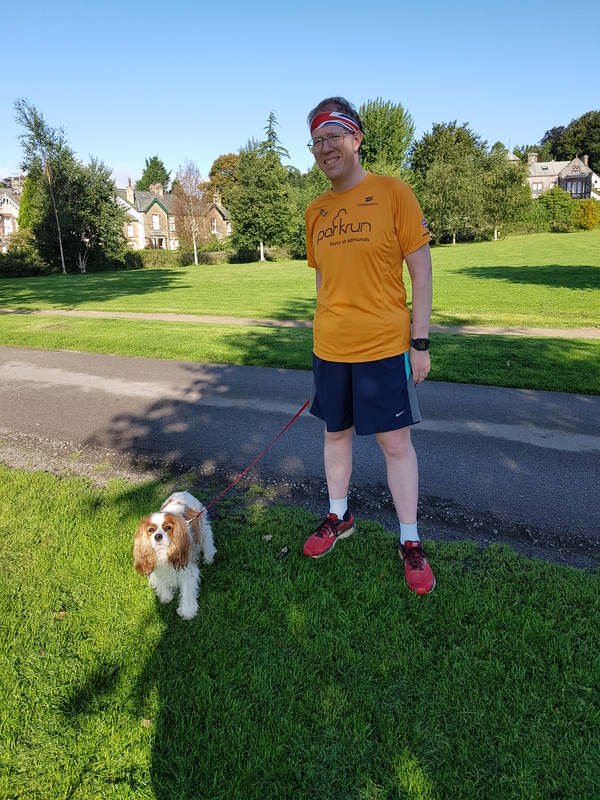 I joined Lucy as she went past with half a lap and the extra bit to go: she was finding it a bit tough with the conditions underfoot being more demanding than her previous two parkruns at Southend and Felixstowe, but still recorded a decent time. A visit to the inaugural parkrun at Manor Field, Whittlesey made me a little anxious as I know inaugural-chasers can risk overwhelming new parkruns, but fortunately the numbers weren’t excessive. It isn’t something I plan on making a habit, but it was interesting to experience the first time once. Today’s visit also enabled me to complete the Cambridgeshire parkruns (for the fourth time). 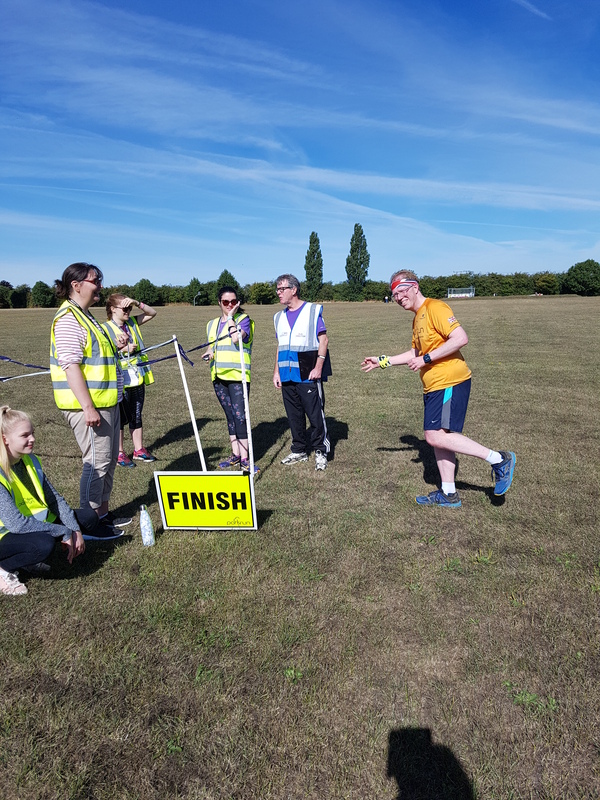 As was to be expected, there were various announcements of thanks to those involved in getting the parkrun off the ground, and not quite the practised fluency that one can get where they have more experience, but all seemed well organised. 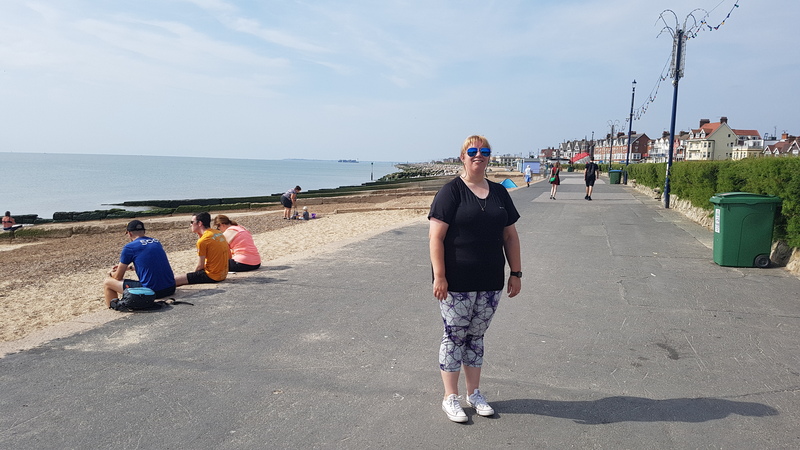 The parkrun is another around playing fields, and to be honest these never sound terribly appealing when reading about them online, but they can still be very pleasant and quite varied in reality – if they are “around” playing fields, then what is on the edge? In this case, the biggest edge feature was King’s Dyke and Ashline Lock which we ran past twice, plus some tree-lined sections and the distinctive smell from the leisure centre swimming pool. 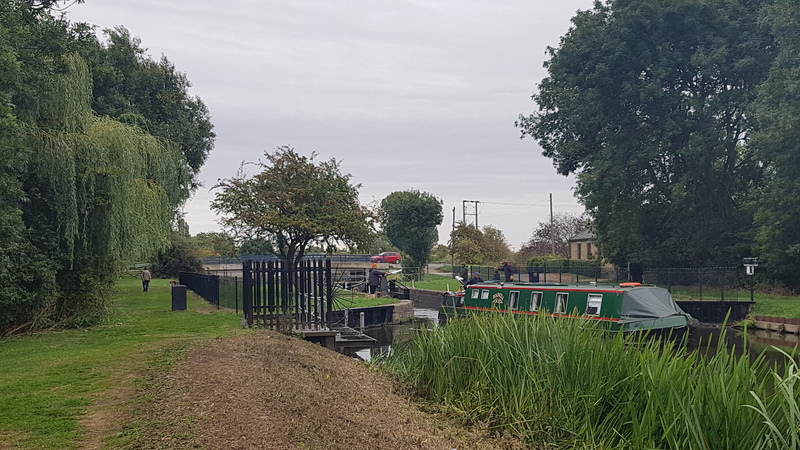 Once again I found someone to latch onto and she pulled me round, all the more helpful today as my GPS watch had a fit part-way round and claimed I was elsewhere in Whittlesey and then back again, and thus all the distances and paces were up the spout. Afterwards, as I was cheering on some of the slower runners and chatting with one of the marshals, I heard and caught sight of steam and smoke from Union of South Africa pulling a train along the track on the other side of the river – I was too slow to grab a picture, but it was still great to see, especially as such a surprise. 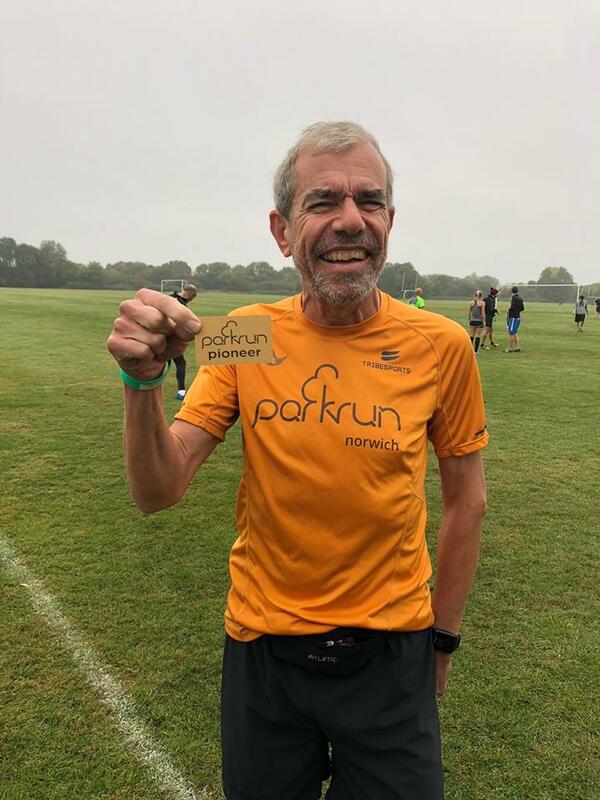 Andrew is one of the 13 Bushy pioneers who ran the first Bushy Park Time Trial, the format which evolved into the parkrun we know today. Today we were on our way to Chester, and at one point had considered a stop in Kettering for parkrun, but the weather forecast suggested it would be raining hard there, and a sunny summer’s day when we can also have a ride on the train would be a better time to visit Kettering. So we picked Coldham’s Common – the second parkrun in Cambridge, thus allowing me to complete all the Cambridgeshire parkruns (for the fifth time!). Although originally Lucy had been going to run too, in the end we decided to save that for another time and get back on the road northwestwards as soon as we could. The route is two circuits of two sets of playing fields, linked by a gate which needs to be used in both directions, and is thus potentially something of a bottleneck, but which was very well marshalled and didn’t cause me any problems. I latched onto another runner partway round the first lap, and she pulled me along at a decent pace. We both accelerated in the final few hundred metres but she pulled away with a better sprint finish than I have. After barcode scanning, I looked to thank her but she’d disappeared so we hit the road for Chester. With the closure of Heartwood Forest parkrun, that takes my East of England tourism tally to 47 out of 70, two-thirds of the way. Although the journey can be more fun than the destination, I’m enjoying the target (even though it keeps moving) and the journey – it will take me a while yet to finish, so lots more interesting places to visit, and some to re-visit. 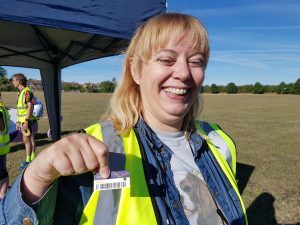 Of course, if we volunteered on barcode scanning they would hand us the #1 token at the end of the race…..
Good point – though it depends how many scanners there are.